Hiking can be a very enjoyable family time. Having a baby doesn’t have to mean that you have to give up those regular hikes. Hiking baby carriers are very popular with parents who love to be outdoors. There are a few things that you need to think about before you purchase a carrier for your baby. We have outlined these considerations below along with detailed reviews of three top hiking baby carrier choices so you are prepared with the right information when you start researching which ones you’re interested in. These top rated baby carriers topped the list for storage capacity, construction, ease of use, comfort-ability, value and much more. If you want to bring your baby with you on day hikes and even camping trips, a hiking baby carrier is exactly what you need. These baby carriers are designed to make carrying your child on your back much easier, especially on longer hikes. Today’s hiking carriers have many features available that make hiking with your baby enjoyable rather than a struggle or stress. After extensive research, we have found the top three hiking baby carriers on the market that parents are talking about and purchasing for their own hiking needs. These three choices top the charts in features, durability and comfortability. Thule Sapling Child Carrier is the perfect way to take your younger child on hiking and backpacking trips. It has a back panel that is fully adjustable and the hip belt is as well making this carrier perfect for both parents. The two zippered pockets in the hip belt make getting to your essentials fast and easy. The back panel is breathable, allowing plenty of air circulation between the carrier and you. This can prevent getting super sweaty and uncomfortable. There is a large zippered compartment and water reservoir pocket that provides the parents with additional storage when needed. There is a sunshade that comes with this baby carrier that protects your little one from the elements while on the hike. It is made of 70 denier nylon and has taped seams and a polyurethane coating that is waterproof. The clear side windows allow the child to still see the scenery while being protected from the hot sun or rain. There is a reflective logo as well that ensures that you are visible even in low light conditions. Osprey provides outdoor loving parents with a comfortable and functional means of bringing their young children along on hiking or backpacking trips. 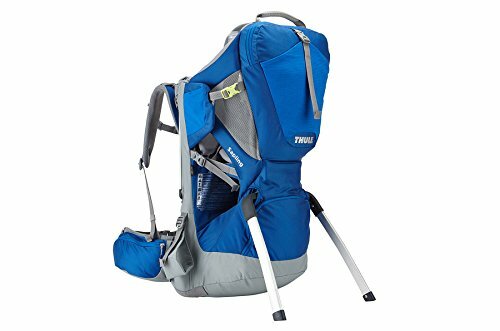 This baby carrier for hiking trips has a lightweight frame made of aluminum that fully supports the child’s weight and provides a sturdy way to set the carrier down in an upright position during breaks. It is constructed from 210D ripstop nylon and fabric, making it long lasting and durable too. 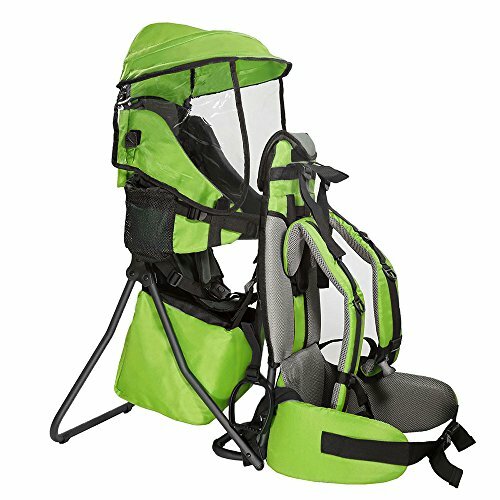 This carrier has several adjustable features including the torso adjustment and the double halo harness that is also adjustable. The child’s seat is surrounded by a padded “cockpit” that is fully framed. It provides plenty of safety and protection for the child while on the hike. This carrier has a built in sunshade that can be deployed quickly from the zippered pocket that holds it. The adjustable hip belt has 5” of extension capability on each side to provide each parent with a custom, comfortable fit. The anti-gravity suspension system prevents the shoulders, hips and back from becoming sore and tired while on the hike. There are plenty of safety features in this carrier including a locking foot stability bar, fully padded child seat, large, reinforced handles that help the parent pick up the pack safely and built in leg loops as well. This lightweight and functional baby carrier for hiking and backpacking can hold a child up to 33 pounds even though the pack itself weighs only 5.5 pounds. There are 3 storage compartments that close with zippers on the back, the lower compartment and there is a small pocket on the waist belt as well. There is plenty of padding in this pack for both the child and the parent so both are comfortable. This ultimate child backpack carrier has an integrated rain and sun shield that can be adjusted for all weather conditions. There is also a 5 point harness for the child’s safety as well as adjustable, padded shoulder straps and lower belt that keeps the weight properly distributed across the hips where the hiker is strongest. There is a convenient water bottle holder so you can stay hydrated on your hikes. The stand collapses and offers reflectors for additional safety. This is the perfect baby carrier for hiking and backpacking trips that will make taking your little one along much easier and comfortable as well. Hiking is a popular pastime among outdoor enthusiasts. With all of the choices available, there is no reason why a hiker can’t take their child along with them on their hikes. All three of the hiking baby carriers featured are customer favorites and are purchased often by parents that want to take their children along for the hike. If you are not sure about the type of hiking baby carrier you need, read our buyer’s guide below so you can get more information about them and decide on the one that will be perfect for your needs and preferences as well. What is a Baby Carrier for Hiking? This is a baby backpack that is designed to be used when parents will be walking for extended periods of time with their children and they don’t want to carry them on their hip or push a stroller. The difference between a regular baby carrier and one designed for hiking is that the hiking variety has an aluminum frame that supports the child as well as other features that enable both the baby and the baby carrier wearer to stay comfortable for longer periods of time. They are perfect for outdoor-loving parents who want to bring their little one along. There are a few things that you need to think about before you purchase a hiking baby carrier. We have outlined these considerations below so you are prepared with the right answers when you start researching which backpacks you are interested in. How much will you be using the carrier? – How often you will be going hiking or going on walking treks with your child will determine the type of hiking baby carrier you need. If you only need it once in awhile, you won’t need as high of a quality carrier as if you plan on using it every weekend and even during the week as well. How long will the hikes be? – If you will be taking longer outings with your baby, you will want to look for a hiking baby carrier that has lots of storage, generous padding and the ability to be adjusted to fit comfortably and correctly. What kind of shape are you in? – Carrying a child that weighs 20-30 pounds is not easy. Even with the right hiking baby carrier, if you have a bad back or you are not in shape, it doesn’t matter what kind of carrier you get, you will struggle. While some carriers distribute weight better than others, you will need to have a good foundation to be able to properly carry a hiking baby carrier to its best ability. There are two basic kinds of these carriers on the market. Each one is described below so you can learn to identify the differences between them. Framed Carriers – Framed carriers are rugged, made of long lasting aluminum frames and can hold your child and gear up to about 48.5 pounds. Most of the hiking baby carriers weigh about 5-8 pounds. Some of the framed models on the market are bulky but overall, the majority of manufacturers try to keep the frames lightweight, with as little bulk as possible. Urban Carriers – The lighter weight urban carriers are better designed for everyday use rather than long hikes. They have a structure to them but tend to look more like regular backpack carriers. Over all they are less bulky than the framed variety of baby carriers. There are a multitude of features that make the process of using a baby carrier for hiking much easier. Below we have listed all of the potential features that a baby carrier designed for hiking may offer. You can decide on the features that appeal to you and then narrow your search based on the features that are important to you. Adjustable – Are you the only person that will be using the carrier? If mom or dad, or an older brother or sister will be carrying the baby in the carrier, you want to purchase a hiking baby carrier that is fully adjustable at the hip, shoulders and anywhere else that it can be adjusted to fit perfectly. You also want to ensure that the carrier can adjust to your growing baby as well so they remain comfortable as they get older. Five-Point Harness – For safety reasons, you want to look for carriers that have a 5 point harness to keep the baby safely in place. With a 5 point harness, there will be two straps over the shoulders, two for the thighs and one chest plate or strap that comes up between the legs. A lap belt or 3 point harness is not secure enough to prevent the baby from slipping out. Comfortable Cockpit – You want there to be enough room in the cockpit of the carrier for the baby to be comfortable, but not so much room that the baby can swim in it. Many of the models available have footrests or stirrups that provide a place for the baby to rest their feet on. This prevents their feet and lower legs from falling asleep. Plenty of padding is also something that you want to look for because it ensures that the baby is comfortable while they are in the carrier. Fabric – Nylon is one of the most common materials used in these baby carriers. The weight of the fabric can range from the very lightweight to a more heavy duty fabric. Other fabric related features include a mesh or ventilated area in the back to reduce sweating while wearing the pack and a lot of air-mesh linings that keep the airflow going. You want to be sure that the material that is used to make the carrier is moisture resistant and sturdy. Also look for light-reflecting stripes or piping so it can be worn and seen when it gets dark. Using a baby carrier after dark should be avoided as much as possible. Buckles and Fasteners – These special carriers have a variety of fasteners and buckles on the shoulders and waist straps for both the baby IN the carrier and the adult wearing the carrier. You want to be sure that the hardware that is used does not slip after it’s been adjusted and that the snaps and buckles are sturdy and too difficult for the baby to get loosened. Kickstand – The purpose of the kickstand on a baby carrier designed for hiking is to hold the carrier in an upright position when it is on the ground. With the kickstand open, the carrier should be very difficult to tip over. Don’t ever use the carrier and kickstand as a baby seat. This is not safe and could result in the baby getting hurt. Some kickstands deploy with the push of a button and others have auto-deploy stands. Make sure that the kickstand is close to the carrier when closed so it doesn’t snag on things as you’re walking. Leg Openings – Leg openings that are adjustable are the best ones to look for. That way they can be adjusted to be small enough to prevent the baby from slipping out when they are little, but can be expanded to the proper size as they get bigger. Padding – Look for baby carriers that have padding that covers the metal frame that is close to your child’s face. You don’t want squishy padding; you want the padding to be on the firm side. You will also want to look for padded hip belts, padded shoulder straps and padded seats as well. Seats– The seat of the carrier needs to adjust so that the child is high enough to see over your shoulder but not so high that they are throwing your balance off and making the walk difficult and uncomfortable. You also want it to be comfortable and padded is a plus too. Shoulder, waist and Chest Straps – You want to get a carrier that is easy to put on and take off as well as easy to get the baby in and out of. Shoulder strap padding needs to be firm and wide for maximum comfort. They should have a chest buckle that is also adjustable and that keeps the straps on the wearer’s shoulders while making sure that they are not rubbing against your neck and chafing. Look for carriers that offer as much adjustability as possible in the straps and that all of the straps are able to be adjusted to your specific needs. Storage Pouches – Traveling with children means traveling with lots of “stuff”. Make sure that the baby carrier you purchase has plenty of storage pockets and pouches for diapering supplies, toys, snacks, drinks and more. Having plenty of storage allows users to be able take the supplies they will need for their baby while on the hike. Sun/Rain Shields – Babies have very sensitive eyes and skin, so when they are riding in the baby carrier on the trail, you want to be certain that they are protected from the elements. Sun or rain shields are good for keeping the burning rays or rain off the baby until you can get to shelter. These shields are sometimes removable so they csn be washed. The best shields are usually designed more like hoods. Make sure that you pay attention to the baby’s exposure to the sun and keep them out of direct sunlight. Mirrors – Mirrors attached to the carrier allow the parent to see how their child is doing in the carrier. If the carrier you choose doesn’t have a mirror with it, you can purchase it separately. It is a very good way for parents to keep tabs on their child and gives them peace of mind that they are doing well. A baby carrier designed for hiking is a great way for outdoor loving parents to bring their babies along on hikes with them in a safe, easy to manage way. There are a lot of different styles of hiking baby carriers on the market so finding the one that will meet all your needs is not difficult, especially if you know what to look for. With the right information you will be able to look for the carriers that have the features you need and the style that you prefer. Use what you have learned in this buyer’s guide and the reviews to make a confident decision on the right carrier that will be the best for you and your baby.